← How Safe Are Our Schools…Really? As if California couldn’t get any weirder, we’re now #1 in UFO sightings. I know, UFO’s stories conjure up visions of people in tin foil hats, but we’ve got too many unexplained observations, some by professionals, some photographed and some picked up on radar so we can’t just dismiss them all as hoaxes. If only 1% of these stories pan out, that’s still more than enough to get attention of scientists and the military. Sometimes the UFOs travel at speeds exceeding Mach 12, then they stop and hover…wha? Sometimes they are supersonic and make a right angle turn. We have nothing close to that and even if we did, humans could not take the G-force. Sounds impossible, right? Not really. Consider how far we’ve come since the Wright bros first flight in 1903 until today. We now have plans for a Mach 6+ aircraft by 2020, so could Mach 10 or even Mach 15 by that far off? I can see us doing those speeds and faster in less than 50 years. We just need better metals, then it’s easy. Now suppose we had another 500 years to improve, what could we be doing then? It could be a whole new game, propulsion that works on an ion drive, or gravity or the earths magnetic field…who knows? So, why do we find it so hard to believe that UFO’s might be possible? That they might be coming here from more advanced extraterrestrial civilizations? I find it far harder to believe that we are the most advanced, most intelligent beings among the billions and billions of planets that make up our Milky Way, not to mention the many billions more galaxies that surround us . Note: Sightings in the database range from the 1950s to 2015. I don’t know about you, but this makes me want to do a little more star gazing this summer. Christopher Mellon served as deputy assistant secretary of defense for intelligence in the Clinton and George W. Bush administrations. He is a private equity investor and an adviser to the To the Stars Academy for Arts and Science and wrote a recent Washington Post article on UFOs. Mellon says numerous discussions with Pentagon officials over the past two years that military departments and agencies treat such incidents as isolated events rather than as part of a pattern requiring serious attention and investigation. A colleague at To the Stars Academy, Luis Elizondo, used to run a Pentagon intelligence program that examined evidence of “anomalous” aircraft, but he resigned last fall to protest government inattention to the growing body of empirical data. Nobody in the military wants to be known as the UFO guy. An unidentified flying object was first detected tearing through the air above Northern California by radar stations in Oakland. It was 4.30pm. It was traveling “very fast at 37,000” [feet]. On October 25, 2017 a strange craft was seen — in broad daylight — flying amid the heavy traffic of the United States’ air corridors above the state of Oregon. Pilots radioed in reports of an aircraft flying outside registered flight plans. F-15 interceptor fighters from the U.S. Air Force were scrambled to take a look. The call with the pilot of Southwest 4712 was by far the most interesting. He immediately notes how strange the encounter was and how he has never seen an incident like it in nearly 30 years of flying jets. The pilot noted, “if it was like a Lear (private jet) type airframe I probably would not have seen it this clear. This was a white airplane and it was big. And it was moving at a clip too, because we were keeping pace with it, it was probably moving faster than we were… It was a larger aircraft yeah.” He also said they watched the object from Northern California all the way to their descent into Portland. 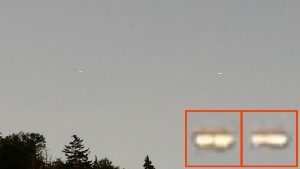 An unidentified white aircraft was indeed flying over Oregon on that day in October, and the USAF and the FAA are both willing to admit that the event occurred. In the Air Force’s case, the fact that they are even willing to tell us that they couldn’t catch or even find the unidentified aircraft with their sensor-packed and fast F-15. A third declassified video, released by To the Stars Academy of Arts and Science , a privately owned media and scientific research company, reveals a previously undisclosed Navy encounter that occurred off the East Coast in 2015. The military personnel who are encountering these phenomena tell remarkable stories. In one example, over the course of two weeks in November 2004, the USS Princeton, a guided-missile cruiser operating advanced naval radar, repeatedly detected unidentified aircraft operating in and around the Nimitz carrier battle group, which it was guarding off the coast of San Diego. In some cases, according to incident reports and interviews with military personnel, these vehicles descended from altitudes higher than 60,000 feet at supersonic speeds, only to suddenly stop and hover as low as 50 feet above the ocean. The United States possesses nothing capable of such feats. This entry was posted in science and tagged CA., California, extraterrestrial, science, UFO. Bookmark the permalink. Wonder if the spike in UFO sightings in Taxififornia is somehow linked to the legalization of marijuana . . . . . . Odds are, we are not alone. Wow, that was great, thanks for the find!